We believe that our clients benefit most from a long-term relationship with a knowledgeable consultant. We help to build effective financial solutions for our clients and their families. We aspire to serve our clients by providing comprehensive and personalized financial services. We care for the sustainability of each of our client’s financial lifestyle, and we address the changes in life that effect lifestyle during ongoing review meetings. We offer a wide range of financial services with a particular focus on personal financial planning for investments, retirement, insurance, and family wealth preservation strategies. We have a strong commitment to the idea that our work will enhance our client’s lives and help them to pursue their dreams. Through Commonwealth Financial Network® (Commonwealth), member FINRA/SIPC, and a Registered Investment Adviser, we primarily use mutual funds and ETFs in our investment portfolios. When building our client portfolios, we take into consideration all pieces of each client's individual financial situation, goals and objectives, time horizon, and future needs. To determine an appropriate portfolio for each client, we rely on analysis and commentaries offered through the Research department at Commonwealth. 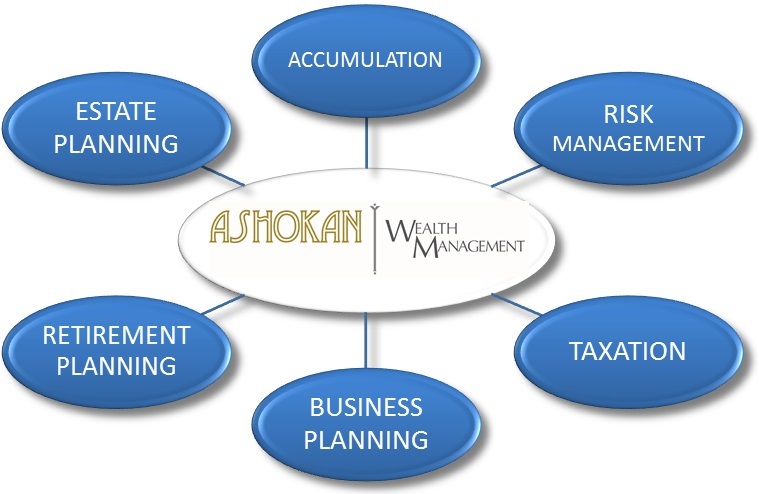 Ashokan Wealth Management maintains mostly managed accounts, but we also offer direct investment accounts. Consulting and financial plans are also available and often recommended for most initial client engagements, then adhered to as a road map for implementing an effective investment accumulation and distribution strategy. Visit our WealthMAP® for more information, or contact us today to find out more about how we can help you plan for your financial future. Diversification does not assure against market loss, and there is no guarantee that a diversified portfolio will outperform a nondiversified portfolio. Alternative investments are not suitable for all investors as they involve substantial risk.